One of the last remnants of the Turkish influence in Hungary, a visit to the thermal baths is a quintessential Budapest experience. We haven’t visited all of the baths in Budapest, but we have been to several of the most famous Budapest baths and the grandiose Széchenyi Baths are by far our favorite. 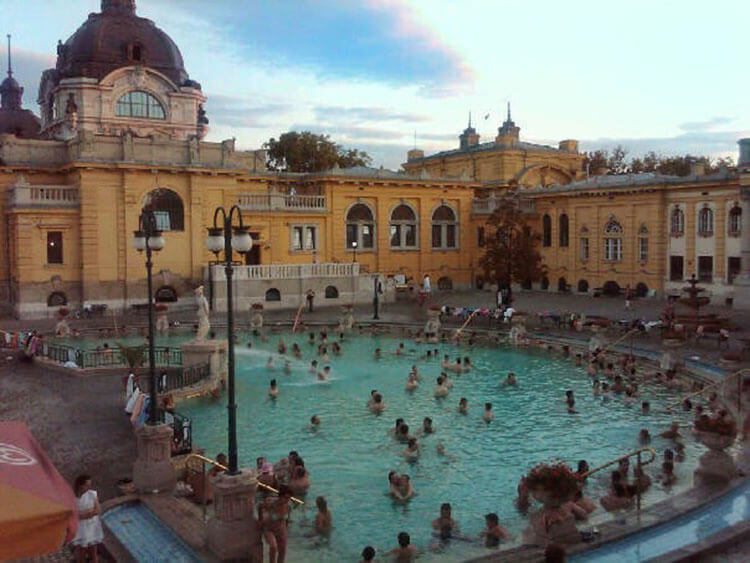 (Check out our comparison in Battle of the Budapest Famous Baths.) Early morning or just before sunset are our favorite times for a soak in the thermal, healing waters of Széchenyi’s outdoor pools. No matter which bath house you choose, a visit to the baths is truly one of the best things to do in Budapest. Wonder what to do in Budapest? You absolutely can’t leave this city without seeing it at night from the river. Budapest is beautiful by day, but absolutely stunning by night as the buildings lining the banks of the Danube twinkle and reflect on the dark waters. We’ve taken a Danube River sightseeing cruise twice, both times at night. One hour evening sightseeing cruises are available with audio headsets that give interesting facts about the history of Budapest, the buildings, and little known facts like that the Rubik’s Cube was invented by a Hungarian in Budapest in 1974. Longer and more romantic buffet-style dinner cruises are also available. We’ve done both and recommend both. Another of the musts when it comes to Budapest things to do: the Chain Bridge. It just also happens to be one of my very favorite bridges in the world. It was the first bridge to permanently connect Buda and Pest and was completed in 1849. At the time, the Chain Bridge was considered to be one of the wonders of the world and the architect was so immensely proud of his work that he challenged anyone to find fault with the bridge. It is said that when it was discovered that the lions that stand guard at either end are missing their tongues, the architect committed suicide. We haven’t missed an evening stroll across the bridge when it is all lit up on a trip to Budapest yet. 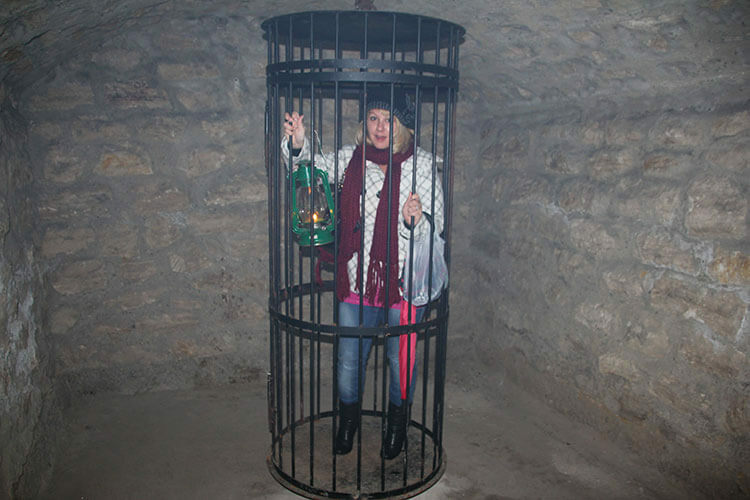 Faust Wine Cellar is part of the vast labyrinth system winding beneath Buda Castle. Gábor Nagy, owner and wine sommelier at Faust Wine Cellar, travels throughout Hungary’s 22 wine regions regularly in search of only the best to supply their cellar with. 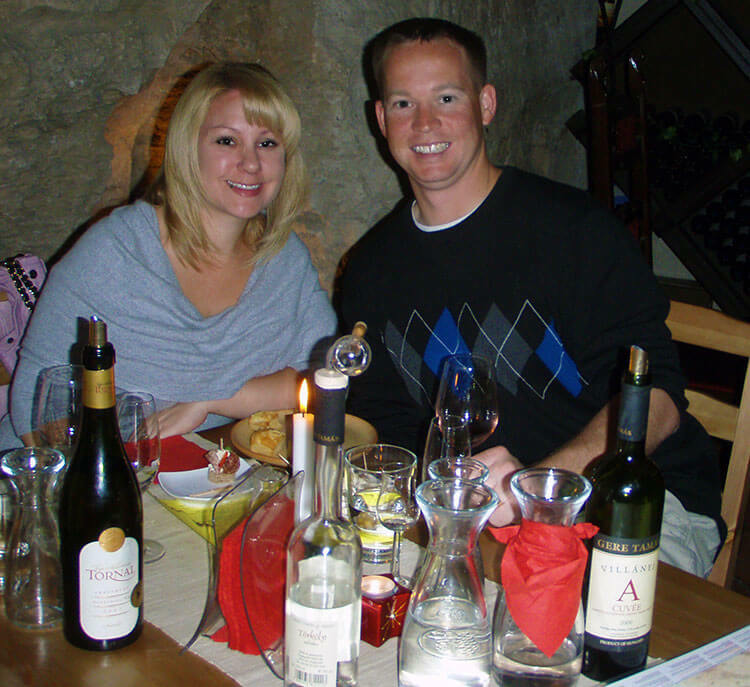 The cellar is such a relaxed and romantic setting and you’ll be sure to leave your tasting with a rich understanding of Hungarian wine. 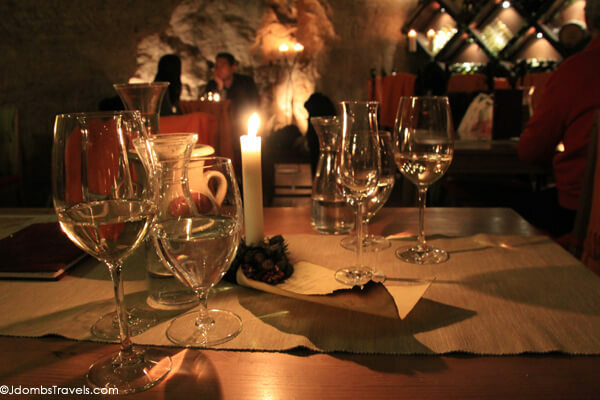 Cozying up with wine in the atmospheric cave is especially one of the best choices for things to do in Budapest in winter when you want to escape the cold for a bit. Those soothing thermal waters of Budapest’s famous baths are responsible for more than a city full of relaxed Hungarians. The rushing waters formed a huge cave system, which is thought to be more than 100 kilometers long. Pulling on overalls, helmets, and headlamps, we prepared to get dirty and we inched on our bellies and wormed our way through tight crevices in “Superman” poses in the longest cave of Hungary, the Mátyás-hegyi cave in the Pál-völgyi cave system. 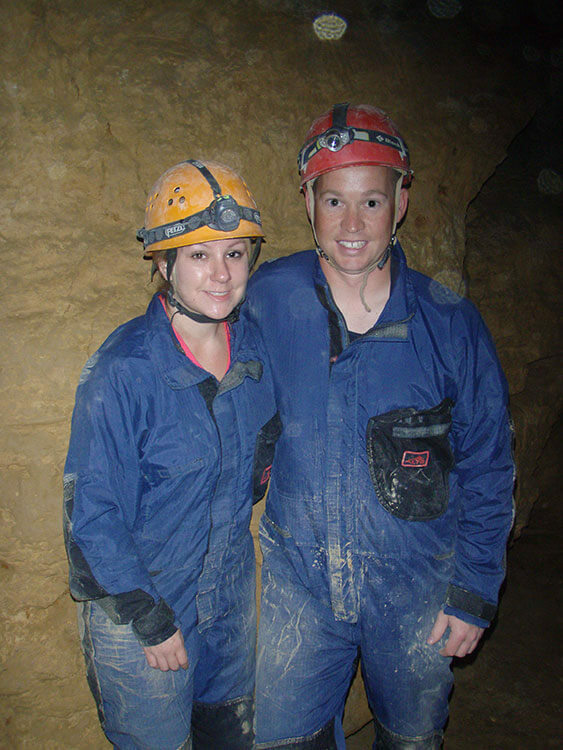 The cave tour lasts 2.5 – 3 hours and is lead by a caving guide. This is one of the Budapest experiences that is definitely not for the claustrophobic since it goes through natural parts of the cave. You won’t find any nicely paved paths, a la “show” caves, in this cave system. Speaking of the worlds beneath Budapest, the Labyrinth of Buda Castle is one of the seven wonders of the underground world and adding to its’ allure and mystery, was closed down in 2011 after police raided it and forced everyone to evacuate immediately. It since re-opened and 1 mile of the 6 mile long labyrinth can be visited. Raining outside, we (including our dog, Emma) slinked around the slightly misty former prison where its most famous prisoner Vlad Tepes, better known as Count Dracula, was held in captivity by Hungarian King Matthias Corvinus during the 15th century with nothing but the light of candle-lit lanterns to guide us. No experience with a segway? No problem! 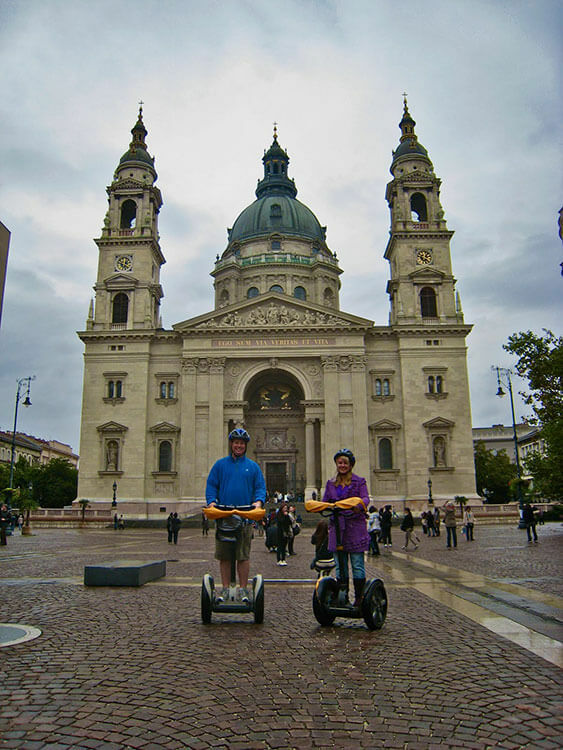 A Budapest segway tour starts out with an orientation on a quiet street to get the hang of operating it. And then we were off, zipping along Budapest’s streets to all the major attractions with our guide Agnes giving us plenty of info along the way. The 2.5 hour tour gave us an excellent introduction to the city, gave us ideas of where to come back to and what to see in Budapest later, and there were plenty of photo opportunities along the way. The neo-Gothic terrace of the Fisherman’s Bastion is located on the Castle Hill and provides panoramic views of the city, making it a must see in Budapest. Blown away by the views, don’t forget to explore the seven ornate turrets, of the fairy tale like structure. The turrets symbolize the tents of the seven Magyar tribe leaders who settled the Carpathian Basin in 896, which ultimately lead to the existence of modern-day Hungary. 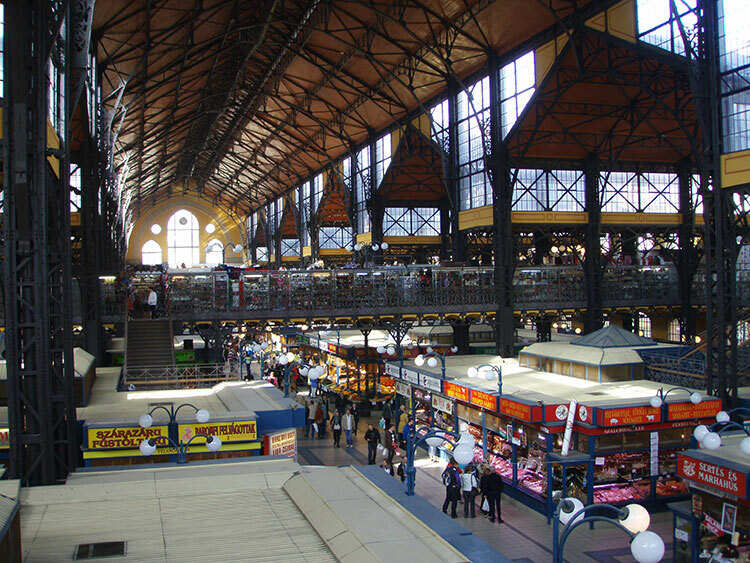 Built in the 19th century, the Central Market Hall is the largest indoor market in Budapest and the focus is on typical Hungarian products. The first floor is the food hall with vendors selling everything from fresh vegetables to Hungarian sausages and Hungarian paprika to Hungarian wines. The market is a great place to visit several vendors for an inexpensive lunch of traditional Hungarian foods and is simply a must do in Budapest. The second floor is full of vendors selling wares like souvenirs and traditional Hungarian embroidery. Budapest, like any other major European city, is filled with touristy restaurants. But it is also filled with local haunts serving sophisticated Hungarian cuisine at reasonable prices. We apply the same logic here as when traveling anywhere else. Avoid restaurants along the beaten tourist path and ask the locals where to eat. 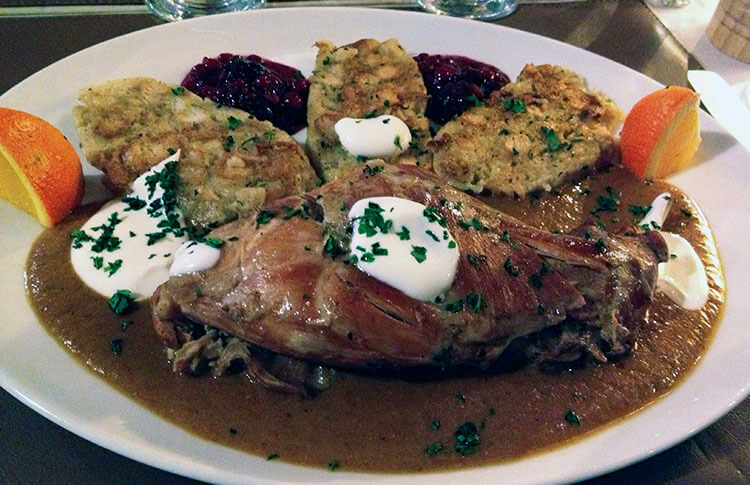 Pálinka Bistrot offers home made traditional Hungarian dishes and we had a delicious meal of Hungarian goulash soup, rabbit with dumplings, gravy, and cream, and paired it all wonderfully with Hungarian Tocai. Cake, truffles and hot chocolate! Oh my! Budapest is full of cafes to have a delicious cuppa joe and try one of the sweets Budapest is famous for. 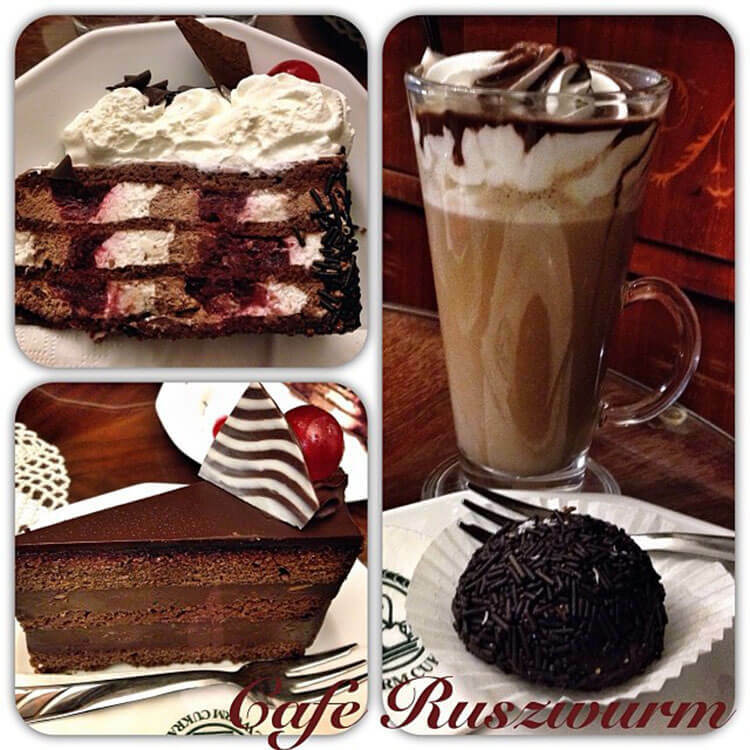 Cafe Ruszwurm, on the Castle Hill, is one of Budapest’s oldest traditional confectioners still operating as a cafe. We sought out the cafe, which has just about a dozen seats, and though we had a little wait for a table we weren’t disappointed. There is a wide selection of the day’s fresh pastries, chocolate truffles, and coffee concoctions to choose from. The decor is charming too with antique furniture and tools of the old confectionery trade in the glass curio cabinets. Cafe Ruszwurm is one of those places to visit in Budapest that you’ll be dreaming of going back to long after your trip. From the Elisabeth Bridge, hike up the sets of stairs and paths for a stunning panorama over both Buda and Pest from the Citadella. Once a fortress built by the Habsburgs in 1854, it was an important strategic point to see over all of Budapest. Nowadays there is a market set up at the top where you’ll find Hungarians pedaling their handicrafts like dolls, wooden toys, and handmade clothing and scarves. But truly it’s the view that you come here for. It’s a Budapest must see and we kicked ourselves for not making the trek up the hill on an earlier trip. Budapest’s ruin bars are still a kind of relatively new trend in a city bursting with all the historical things to take in. 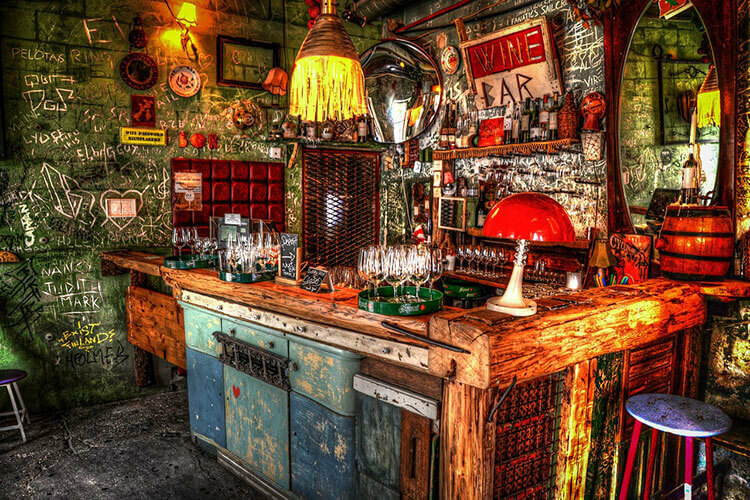 The first ruin bar was Szimpla Kert, which settled in to its permanent home in the Jewish Quarter in 2004. And ever since, the derelict and abandoned buildings of Budapest have been transformed in to the most stylish places in the city to enjoy a drink. These days it’s just about impossible to keep up with the sheer number of ruin bars, each with its own unique personality. From the relaxed to the ultra trendy, you’ll find everything from craft beers to tacos and tequila at Budapest’s various ruin bars. And you’ll also find every age from millennials looking for a hipster place to party to retirees looking for a casual place for drinks and conversation with friends. If you want to discover some of the most original and authentic ruin bars in the city with a local, book at ruin bar pub crawl with Pub Crawl Budapest. It’s definitely one of the top things to do in Budapest for young adults. The citadel, atop a 328 meter high hill, was originally built in a triangular shape and had two towers. It dates back to the 13th century and was home to Hungarian kings. It later became their summer residence. New wings and an external wall were built during the Angevin period. Around 1400 King Sigismund also had a third curtain wall constructed and enlarged the palace buildings. At the end of the 15th century, King Matthias Corvinus had the interior part of the castle renovated. The upper castle also served for the safekeeping of the Hungarian royal insignia between the 14th century and 1526. The hexagonal Solomon Tower was built in 1258. 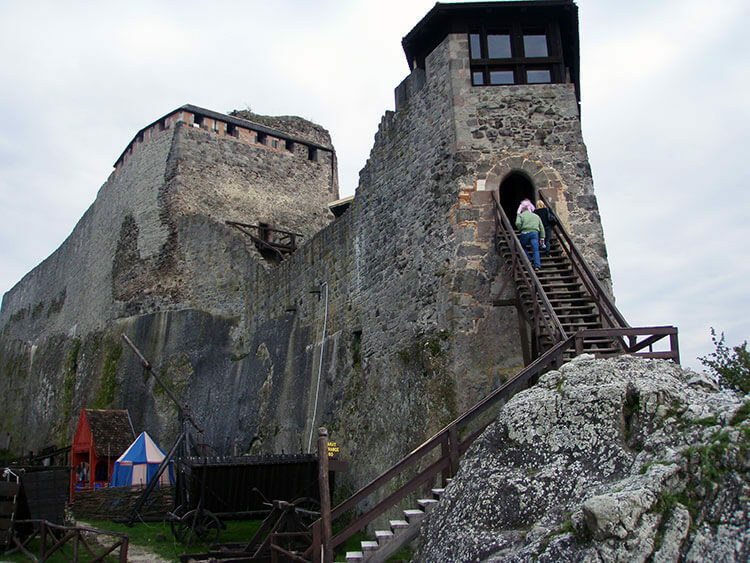 Vlad Tepes, more famously known as Dracula, was imprisoned here between 1462-74. So if you want to visit the real “Dracula’s castle,” head to Visegrád and not to Romania, as Vlad the Impaler never actually lived in Bran Castle. Visegrád can easily be reached with a car rental from Budapest, which we prefer so that we can explore at our own leisure. If you don’t want to rent a car or do this day trip on your own, this Danube Bend Day Trip from Budapest is a good way to visit both Visegrád and Szentendre. Szentendre is another small town at the foot of the Pilis Hill along the Danube Bend and the day trip can be combined with a stop in Visegrád. Szentendre was part of the eastern frontier of the Roman Empire under Ulcisia Castra from the 2nd centuty AD. In the 13th century the Mongols and then the Turks in the 15-16th century destroyed the town. It was rebuilt in Baroque style in the 17th century and has been preserved ever since. A Barqoue cross stands in the main square, Fő tér. The cross was erected in 1763 to commemorate the fact that plague avoided the town. The Baroque-Rococo Blagovestenska church also stands tall in the square and was built by settlers living in the Greek quarter next to the church in the mid 18th century. Above its wooden gate are frescoes of St. Helene and St Constantine. 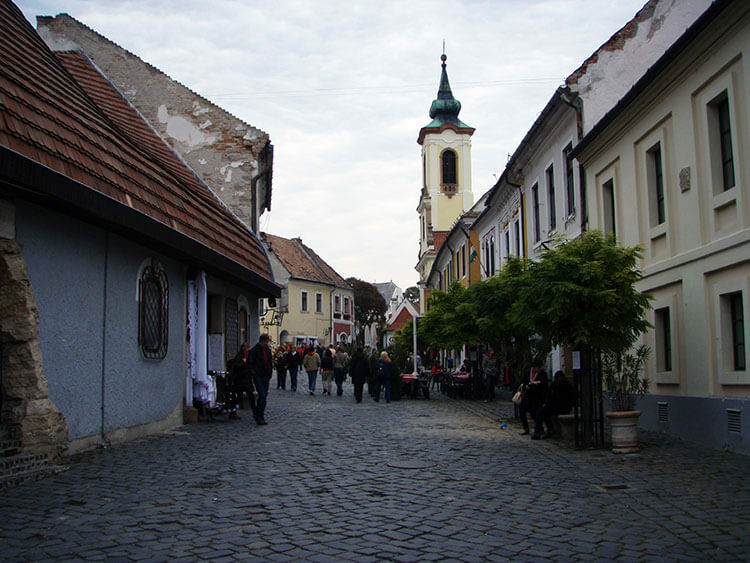 Winding streets lead off from Fő tér and are packed with museums, restaurants, cafes and souvenir shops. Stop by any of the shops to find Tokaji wine, pálinka (Hungarian fruit brandy), Hungarian paprika and goose liver. Stop by the Labirintus Restaurant in the National Wine Museum for a delicious Hungarian meal.You can dine in three different rooms: in the Tokaji Room in the cool cellar, in the Kupa Room on the ground level, or in the Vadász (Hunter’s) Room on the first level. In The 220 year old cellar system, you can taste and buy fine Tokaji wines. We dined in the Kupa Room, which intimately acommodates just 24 people. Its countryside atmosphere is reached through the exhibition of authentic objects from the every-day life of the village. Try the garlic soup in the rye bread bowl and the turkey breast stuffed with peach and camembert. Don’t miss a stop in the Szabó Marzipan Museum, where you can follow the process of confectioner work and marzipan handicraft. 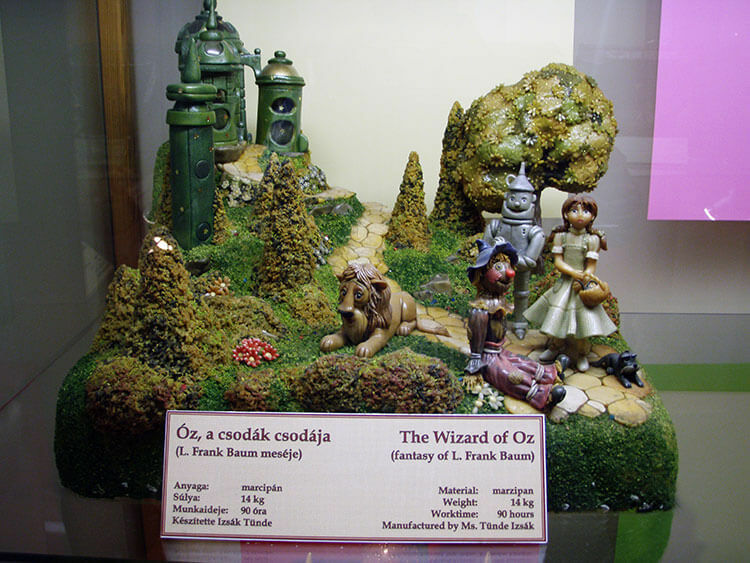 The display cases have marzipan creations of many Disney characters, a 2-meter tall Michael Jackson made of white chocolate, a Princess Diana, the 160 cm long Hungarian Parliament building, and a wedding cake so large that it would need 970 eggs, 25 liters of cream, 15 kg of butter, 35 kg of sugar, 15 kg of chocolate, 20 kg of flour, and 10 kg of icing. We’ve stayed at various accommodations over our years visiting Budapest and though we don’t often advocate for holiday apartment stays, we really love Golden Stars Apartments. Right in the heart of the city and close to all of Budapest’s attractions, the luxury holiday apartments give you the best of both worlds. The stylishly decorated apartments have the elegance of a luxe hotel, while still offering amenities like a full kitchen, washing machine and multiple bedrooms at an affordable price. And the owner, Tomas, runs the properties as a business, so you get the great customer service of a hotel at a holiday apartment. Don’t just take our word for it – read the TripAdvisor reviews. 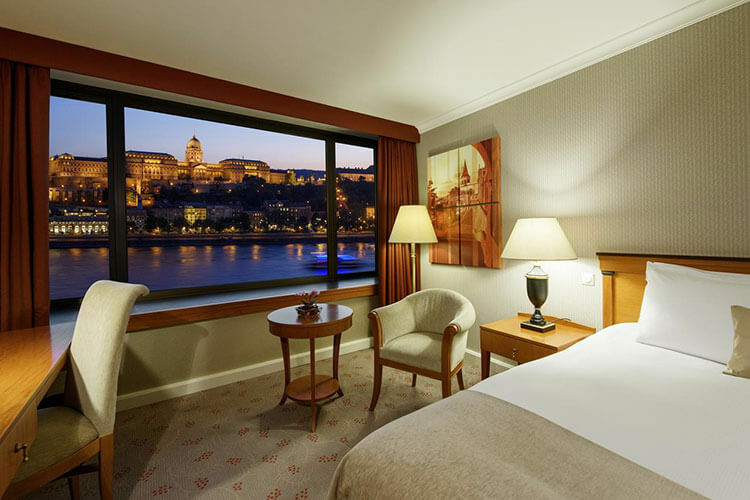 If a traditional hotel experience is what you’re looking for, Intercontinental Budapest is steps from the Danube and Chain Bridge. 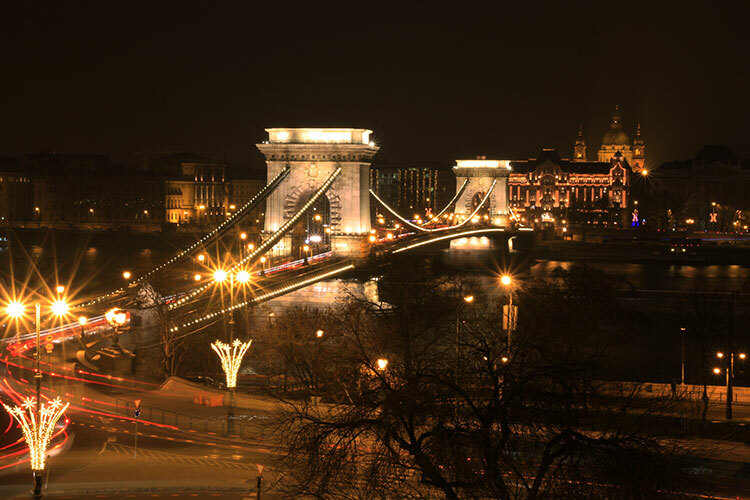 With a stunning view looking to the Chain Bridge and Royal Palace, there’s hardly a more prestigious spot in the city and many TripAdvisor reviewers agree. The hotel is an excellent position for exploring all Budapest has to offer by foot and by tram, with a stop just in front of the hotel. The rooms are decorated classically with neutral Intercontinental interiors and have modern amenities. The hotel is also pet friendly, unlike the Golden Stars Apartments, and is a perfect spot if your furry family members are coming along like when Emma joined us for a New Year’s trip to Budapest. 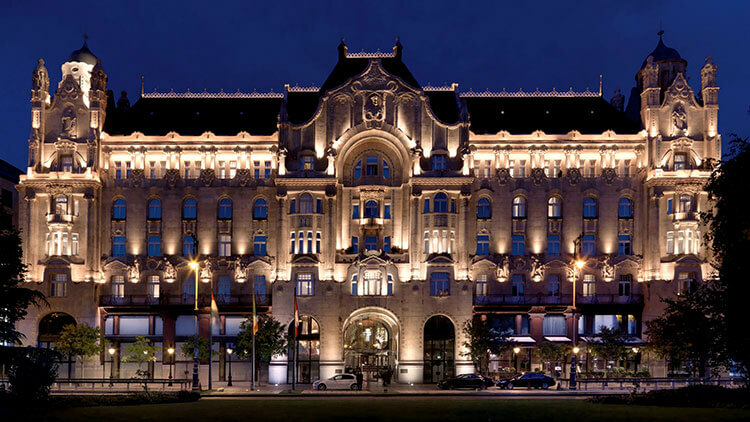 Four Seasons Hotel Gresham Palace is the epitome of luxury in Budapest. 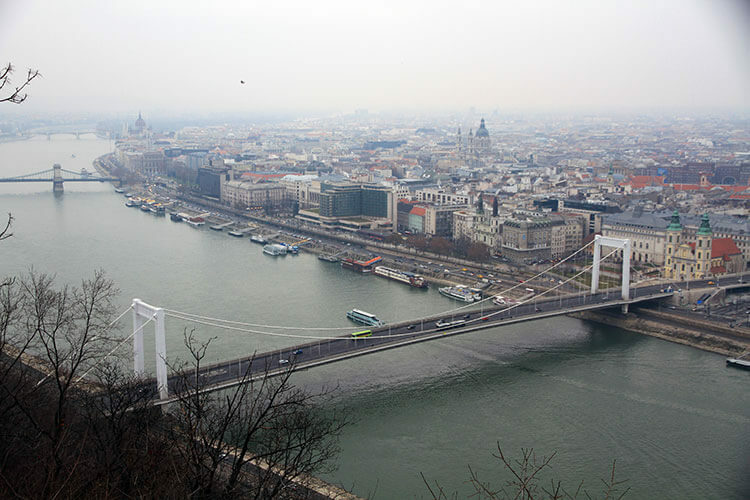 The Chain Bridge practically spills on to the palatial hotel, which has panoramic views of the Danube and Buda Hill. 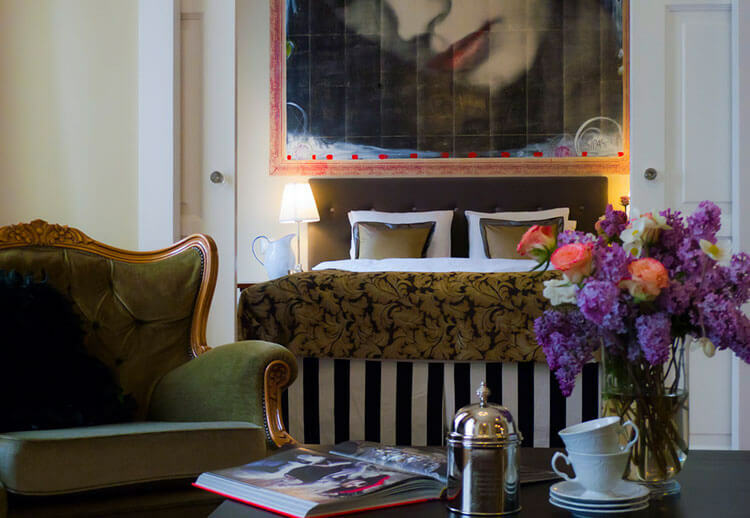 It’s among the best hotels in Budapest. The posh rooms are an art-deco design and many of them have step out balconies that you can admire the twinkling lights of Budapest from. Located just 400 meters from St. Stephen’s Basilica and at the end of the Chain Bridge, you’re in the heart of Budapest. And Four Seasons is also pet-friendly. This article contains affiliate links. When you book on Booking.com , Viator, TripAdvisor or GetYourGuide and shop on Amazon through our affiliate sites, we earn a small commission at no additional cost to you. Don’t forget the House of Terror museum! We haven’t been to the House of Terror museum. Now I need to look it up for our next trip to Budapest! Any recomendations on places to stay for 2 nights for a family travelling with a 7/6/1 year old? Born in Budapest, Hungarian, and living in France, I was happy to read your nice comments about my city. I am so happy that you appreciate Budapest. Thanks, Suzanne! Budapest is our favorite European city and we’re always happy to visit again and again. With so much to see, we don’t return to many places often. Spent 4 days in Budapest and is a beautiful city with great food. However one thing that leaves a sour taste in your mouth are the scammers that try to rip off tourist . The Budapest authorities need to clean this up as this will stop me from going back as it would many others. Google scams in Budapest and see just how widespread the problem is. I’m sorry to hear that you encountered scammers, Dan. It’s something to watch out for all around the world though, really. From our own experiences in our half a dozen visits to Budapest, we’ve never encountered any scammers. Scammers in every city in the world!! Can you tell me what to avoid as far as GOogle Scammers in Budapest? Should I pre-book anything or wait till we are there. I have only rented an ABnB. Happy Easter to you too, Stef! We hope you make it to Budapest soon. It’s such a fantastic city to visit. The Labyrinth of Buda Castle looks so stunning… Are travelers allowed to get inside it? Hi Jemma! Yes, the Buda Labyrinth re-opened to the public and although a bit cheesy with the wax figures in the opera scenes, it is fun to visit. What a great list. A visit to Budapest is definitely in my sights and I find it interesting that you like it even more than Paris. There are some unique sounding things to do in the city. Thanks for the great suggestions. You’d love the caves, Leigh! And there are some great bike tours around the city too. I haven’t been in Budapest since 1997 and even then only for a weekend. I liked it well enough to want to go back, but haven’t managed it yet. Was kind of rooting for TBU being there. Ali hasn’t seen it yet, so it will be an easy sell to get her to go along. Now that would be a fun TBU! I absolutely love Hungary and it never takes much even to twist to my to hop in the car an go for the weekend. Great list! I think I’ll pass on the cave stuff, not my thing at all, but everything else sounds great. Like Andy said, I haven’t been yet, but just about anyplace in Europe is always high on my list. Good to know you and Tim like Budapest so much! A lot of Europe is beginning to feel exactly the same from one city to the next. But we could go to Budapest again and again. For us, there’s the perfect mix of activities there! Yes, not only visiting the House of Terror, but having tea and cake at Gebreaud cafe on Vaci ut. which is one of the oldest cafes in Budapest. Vaci ut. is also a pedestrian-only area with loads of shops (the usual proliferation of brand names + tourist-centred shops). Also recommend the Jewish quarter esp. the little streets behind the main synagogue, as well as the Oktagon area not far from Nyugati main train station. I love Budapest too! I don't live too far from this magnificent city (about a 7-hour ride by bus, 5 by car). It helps to know a bit of Hungarian as well. Gives the local people a thrill since the language isn't one of the easiest to learn. Very good list thank you so much! Glad to hear you enjoyed it, Ben! Hope you get to visit Budapest and do some of the things on this list. It’ s very ironic that you love both St. Maarten and Budapest!! I own a villa on SXM! And, currently visiting Budapest ! And, yes I will definitely return here! I absolutely love it!!! Informative post Jen – we’ll be based in Prague next summer and intend to make some trips to some of the Eastern European cities. One of those is Budapest. Will make sure to keep a copy of your list. Eastern Europe is great! Prague is on our list to get around to blogging about eventually. You’ll enjoy both cities for sure. Visiting Budapest in April, somewhere we have wanted to go for a long time. Looks amazing, I have a feeling it is going to knock some other cities down the list of my favorites! How was your trip to Budapest Nic? Did you love it as much as we do? We absolutely loved it, it was unlike anywhere else we had been really, the city is amazingly beautiful and the people are so friendly. I am in Budapest on my own for a week, is it easy to get around and do these exciting activities, I’m no youngster but am physically fit. I have been before but only for a couple of days and just did some walking. Hi Mary! Yes, Budapest is really easy to get around either by walking or using the great tram system. How did your return trip go? hi! planning on going to budapest in july! was wondering if you had any advice on hostels? or general safety tips for women travelling alone! thanks jennifer. im going to budapest this september. im actually stationed in aviano, but live in sacile. hope i get to experience as much as i can there. Great article. My wife and I are thinking about heading to Budapest this summer, but we are in a bit of a quandary- do we do Vienna and Salzburg, or Vienna and Budapest? What would you recommend?? Thanks! Hi Tim! I think it really depends on what you’re in to. In our opinion, there’s a lot more to do in Vienna and Budapest than in Salzburg. Salzburg is a much smaller city than either Vienna or Budapest. Either way, Bratislava is just one hour away from Vienna and we suggest you visit while there. It’s a cool city to check out, but you won’t need more than a day in Bratislava. planning to fly into Budapest in may . how many days do u suggest? am impressed with ur tips. any nice place to stay? 2 ladies from Mumbai india. I booked 4 days in Budapest with my boyfriend as a surprise trip for his birthday in 2 weeks. You’re going to love Budapest, Amanda! It is our favorite European city. Check back with us after your trip because we’d love to hear about it! That’s great, Tom! I’m sure your friend will be able to show you some hidden gems that we’ve yet to uncover. Enjoy your trip to one of our favorite cities! My name is Tamas, I am writing from the Hospital in the Rock Nuclear Bunker Museum. I really like your website and I wanted to invite you to our museum next time you are in Budapest. 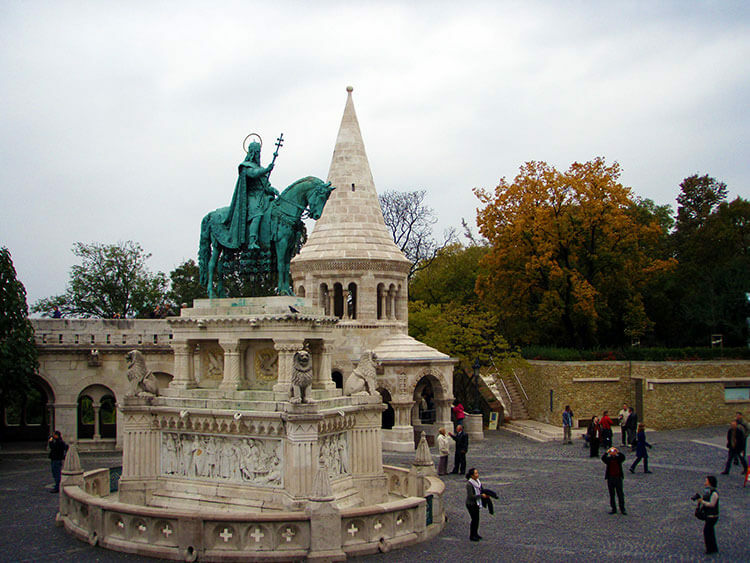 I would be happy to show you around so you can add it to your listing about Budapest. Thanks Tamas! We’ll let you know when we come back to Budapest. Great post! I’m heading to Budapest in a few weeks and you definitely helped me out with some inspiration on things to do and see. I didn’t even know you could go caving in Budapest and I spent more than a week there last year. Palinka Bistrot is going to be one of my first stops since that goulash looks absolutely delicious! Flying to Budapest this month. December is not great timing, so I’m told, but curious to get your thoughts for recommended things to do in December. Also, what’s the best mode of transportation from the airport and also looking for some great dining options for local food and nightclub/bar recommendations? We would still recommend all these same things to do in December, plus you can also visit the various Christmas markets around the city. To get to the city center, you can take the M3 Metro. Taxis are also very affordable in Budapest, so it just depends on your preference. Thanks for this article. I’m planning to travel to Budapest and your article is very useful ! Once I visited Budapest solo and took a free walking tour, enjoyed the performance at the world famous Budapest Opera House, visited the Museum of Fine Arts et.c, all n all it was a great fun. I think when you are in Budapest you must take a waking tour and by doing this you will utilize your full day. Insightful article indeed. I’m coming to Budapest on business soon and will have only one a couple of days to explore the city. My question would be, what is the best way to get into the city from the airport? Thank you in advance. Great article? i also would suggest great places for Your evenings like the restaurants and coffe shops of Kiraly street or Liszt Ferenc square or the square in front of the Szent Istvan Bazilika. Here You can spend a great evening among the locals as well? Excellent article, really thanks. I’m planning to travel to Budapest in a month. How could you reach the city centre easily and fast from the airport. I was checking this transfer service but not sure if they are the best? Any oppinion or experience with them? To get to the city center, you can take the M3 Metro. Taxis are also very affordable in Budapest, so it just depends on your preference. A very nice city with great architecture. You can travel for free on the public transport if you are over 65 and can show relevant photo id. I would recommend the amazing Great Synagogue and the Jewish Quuarter which is a Centre of food and wine at night. Definitely a place for the young and full of atmosphere. If your trip is to Europe the most outstanding city is London by far though and if you are a speaker of English it is an added bonus. Thanks for that top about the free travel on public transport for people over 65, Anne! I’m sure it will come in handy for many of our readers. Yes, the cave maintains its temperature and you can do the cave tour year round. The labyrinth is also open year round. Enjoy your trip! Hieeeee.. I am planning to go to Budapest on 16-19 April 2017. Is it a right time. Cud you suggest some hotel or hostel where I can stay and explore city easily. If any one is interested in joining me to my Budapest trip you are welcome. Also I planning for Prague after Budapest. Anybody is welcome. This is such a great summary of my hometown. I loved it. Thanks for sharing. The thermal baths are the same year round. The water temperature doesn’t change. We did visit the Gellért Bath, which we reviewed linked in this article. 🙂 We just don’t like Gellért as much as Széchenyi’s outdoor pools. I just read your ideas for Budapest. I did the bath at the Gellert Hotel. I really never felt so clean. I wondered why you didn’t mention visiting the gorgeous Parliament building. I did try but it was a Monday and it was closed. Also, I don’t recall the name, but I may have a credit card bill, but I stayed in a cute B&B which was almost across the street from the castle or the bastion (I never heard that word before!!). I may be able to provide it to you. It was also a family business run by a nice man. It was not a far walk from the bus stop. I loved your picture of the market. I went there, and I bought a tiny bag of paprika, and admired the embroidery. Another place you missed is the Museum of Terror. It too was closed the day I was there, but out in front was a display on the sidewalk about the horrors of the revolution in the 1950s. It was very educational. I had recently read the best book I ever read just before this visit. Please read Swimming Across and it is very descriptive of this sad time in history. I ate at the New York Cafe. I live in NJ and am a New Yorker at heart and this was really an interesting beautiful cafe. I should do what you do. I have seen articles, maybe in Budget Travel, for people to be travel writers. I think about it, but don’t do it. I admire your work. I emailed you a question earlier today about Italy. Thanks for your comments about Budapest! I’m not sure why we didn’t mention visiting the Parliament building. We did visit the Parliament on our first trip to Budapest. It may have been that at the time photographs weren’t allowed inside, and if we don’t have a photograph then we don’t typically write about it. We didn’t mention the Museum of Terror because we don’t really do museums. It’s not our travel style and while we try to be informative, we also are still opinionated and follow itineraries that suit our own travel style. Hope that you enjoy your trip to Italy and you should have received our reply to your comment about that a while ago. Thank you very much indeed for your tips and suggestions. Glad to hear it, Wendy! Enjoy your trip to Budapest! There is more than just Budapest in Hungary! We have so many beautiful places in the countryside too. My wife and i are going to budapest in april for our honeymoon, we wanted to do sight seeing. Any suggestions on the best way to get around town?